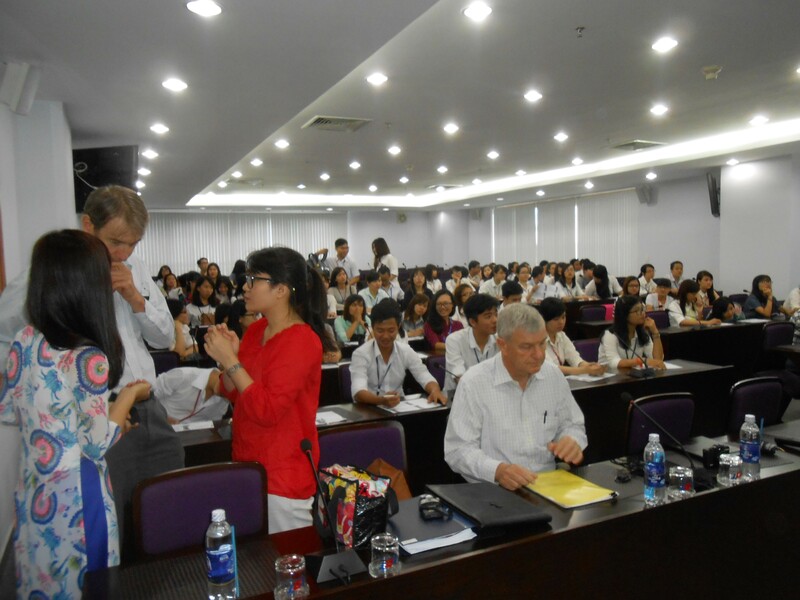 This morning there was a presentation to the faculty and students of the Labor Relations and Trade Unions faculty by Alan Boulton, who recently retired as a labor board judge in Australia, and Phillip Hazelton, who is one of the ILO country staff in Hanoi. It took place over on the top floor of A Building (presumably the first and oldest classroom building here)in a room that accommodated a couple hundred people, seemingly mostly students, in padded chairs on a raked floor. There was a microphone on the desk in front of each chair. The overall topic was the changing shape of the industrial relations structure in Southeast Asia, known as the ASEAN countries. Vinh welcomed the speakers, who had brought their own translator from Hanoi. Ms La showed me and Joe where to sit, in the front row. Boulton, who did most of the speaking, said that there is movement throughout the ASEAN countries to raise minimum wages, set up task forces on working conditions, possibly sign the ILO convention on freedom of association (meaning independent unions), develop stronger collective bargaining practices, use more mediation and overall increase support for the structures of industrial relations. In Vietnam, the wildcat strikes are the phenomenon that is driving this movement. A letter of intent has recently been signed to do an ILO project to support industrial relations reforms in Vietnam in cooperation with TDTU. Phillip is the coordinator of that project. Alan used Indonesia with its $607 per month average as an example of how fast things can change, as part of describing to us what the future may look like in Vietnam. Alan’s audience this morning was mostly students who are taking these classes in order to become HR professionals with some who want to be union staff or government IR professionals. If these changes take place, the role of HR professionals will fundamentally change. If the changes include the clarification of the separate interests of labor and capital and the appearance of self-organized bottom-up activist unions, HR professionals will become clearly management and no longer likely to also be found serving as the union president. Twenty years ago, Alan said, Indonesia was one of the ASEAN “Tigers.” The only concern was economic growth at any cost. Indonesian labor relations were under tight central government control. The Labor Ministry regulated employers. Compliance was required. Labor unrest would bring out the police and the military. Union leaders were arrested and disappeared. Then in 1997-98 came the Asian economic crisis. It brought down the Indonesian government. There was pressure on the new government for change from the World Bank, the International Monetary Fund, the international community generally and from within Indonesia. If ASEAN countries were going to have access to world markets, there were going to have to be some changes. “Sustainable economic growth is only possible with recognition of human and labor rights,” said Alan. The reason for the changes, he said, is that the old systems don’t work. An industrial relations system needs respect for rights at work (ratifying the ILO convention on freedom of association, for example); effective labor market institutions (labor ministries, employer organizations, union movement organizations); dispute resolution practices and workplace cooperation. Challenges that face implementation of dispute resolution practices are going to be similar in all ASEAN countries and in fact for Europe and the US, too: you need good dispute resolution practices on all levels, both workplace and higher up (between union, employer and government, tri-partite level); strong labor inspection services; well-resourced mediation and conciliation services, and an adjudication/arbitration system with labor courts or tribunals. He notes hurdles for Vietnam: The Vietnamese labor movement is quite strong, and in fact is part of the government. However, the question is how much it represents workers and if it is effective. When he finished, students asked questions about migrant workers, one about wage theft (this from a student who had been staying with Leanna and Hollis) and the biggest challenges for Vietnam. I raised my hand because I was starting to understand something. The movement toward change in Vietnam is driven by these wildcat strikes. That seems to be something everyone agrees on. These strikes are unpredictable, not authorized by the VGCL, not official and apparently leaderless – or at least the leaders cleverly make themselves unidentifiable. Compare this with the US, where preparations for a strike are public, debated, voted upon and publicized as much as possible. AFT 2121 (the faculty union at City College of San Francisco, that Joe has been a member and leader of for many years) took a vote and set up a very public emergency strike fund, for example. Some unions picket with picket signs saying “Just Practicing.” What’s the difference? One way to explain it is that the threat of a strike has power. If the union has a credible strike threat and the employer wants to avoid the strike, the threat can influence what happens at the table and elsewhere in union-employer relations. Whereas in Vietnam, there is no comparable strike threat. There are strikes, but no strike threat. A strike just happens and the employer loses production until the workers are brought back to the table. In the US, you don’t have the strike as often because the threat is enough. However, in order for the threat to be serious, the union has to be really strong and well-organized and it has to be a real threat. It’s true that real strike threats, not to mention real strikes, have been on the downturn in the US for decades reflecting unions’ shrinkage and weakness. But when strikes happen, they take place with lots of preparation and pre-publicity. Vietnam: Strikes, but no strike threat. Unless you consider overall labor turmoil a general threat (and it’s having that effect, apparently). US: Strike threat, but not necessarily a strike. There are points at which organizing a strike threat has a lot in common with civil disobedience. I keep thinking of the Pittston coal miners strike. The message that civil disobedience sends it that unless someone (the employer, for example) stops doing something, violence will ensue. It’s a threat of violence but the violence will be performed by the other party, not by the people who are doing civil disobedience. This relates to the collective bargaining scenario that Joe and I have written and sent to Vinh for translation, and which we will be running in about a week for a requested open simulation series. This is the first of 6. After asking around (Leanna and Hollis, Jan Sunoo) for some advice, we decided not to use any of the existing role plays that we’ve got but to write one specifically about bargaining for union power. So although it’s about pay, it’s about the structure of pay and it’s really about moving from a pay structure (piece rate) that undermines worker unity to a pay structure that unites workers (hourly). It’s based on a real situation that I encountered in Chicago, with the PACE Paratransit workers. Their employer was trying to move them from hourly pay to pay-per-passenger, and the union was in an uproar about it. They understood clearly that moving to a piece-rate system would be a threat to union power. They saw themselves as a body of workers who were essentially extensions of the healthcare system, moving disabled passengers from home to social life to medical appointments, sometimes even doing medical services, often working with people who were confined to electric wheelchairs. They were proud of this aspect of their work. Pay-per-passenger turned them into taxi drivers, solo operators, encouraged hurrying, undermined their identity as doing a socially necessary job that required more skill than just covering a route. So this scenario takes this single issue and makes it clearly a power-of-the-union issue, including a building a strike threat with lots of preparation and publicity on the ground (getting clients to sign a petition, for example). Of course we begin with the technical stuff like how do you choose a bargaining committee, different roles, note-taking, caucusing, etc. Listening to Alan and Phillip made me even more confident that we’d chosen the right thing to try to teach in this collective bargaining simulation. It’s not about conflict resolution, it’s about union power. European unions took a different direction, avoided that trade-off, so it shouldn’t automatically embedded here. Conditions are different from both U.S. and European unionization. Social and cultural history could yield clues. Just off hand, it seems like new territory. That has to be exciting. About the translation — machine translation is much better than it used to be but will still miss linguistic nuances. What about a class translation project? Translation is, after all, an ultimate close reading — or the proverbial treason. Hi Helena, Fascinating; thanks for the efforts to keep us in touch w your reality. The transition from wildcats to organized strike prep and threats and into stable union power independent from management sounds tricky: to wit, how to avoid the bureaucratization of the CIO that accompanied this during/after WW2. As I recall, setting up union shops and dues collection were part of a trade-off wherein the union officials got guaranteed income (mgmt collected dues) in exchange for ‘labor peace’. Union officaldom was held responsible to enforce ‘discipline’ vs wildcats and it did so. Not opposed to stable unions, but wondering if any of this seems embedded in the evolving struggle there.